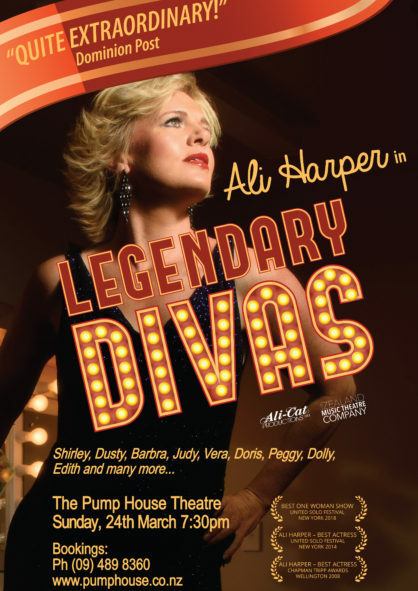 Legendary Divas is a show starring award winning actress and singer Ali Harper and honours the legendary women that inspired us with their music… talented, hardworking, original and courageous women who gave so much of themselves, no matter the price. Shirley Bassey, Dusty Springfield, Judy Garland, Doris Day, Barbra Streisand and many more..
Expect nostalgia, comedy, audience participation, a rip roaring 80s medley with a splash of Madonna as well as many stories enlightening the audience; French Chanteuse Edith Piaf’s connection with the Resistance, a Julie Andrew’s ‘My Fair Lady’ spoof to Dolly Parton and her love for the ‘nip and tuck’. Glamorous and captivating, Legendary Divas is a feast for anyone who wants to reminisce and celebrate those extraordinary women who will always remain in our hearts through their music. Ali will be joined by David Sidwell on piano so grab your friends and see what everyone is raving about!